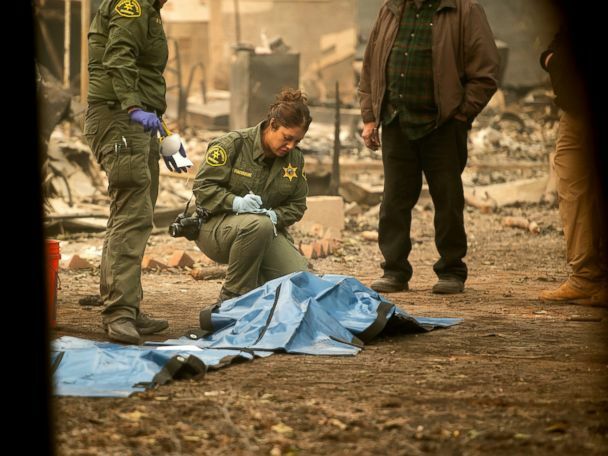 A search and rescue team combs through the debris for possible human remains at Paradise Gardens in Paradise, Calif., Nov. 16, 2018. An undated handout photo made available by the United States Forest Service and the National Wildfire Coordinating Group, Nov. 20, 2018, shows firefighters battling the Camp Fire in Northern California. 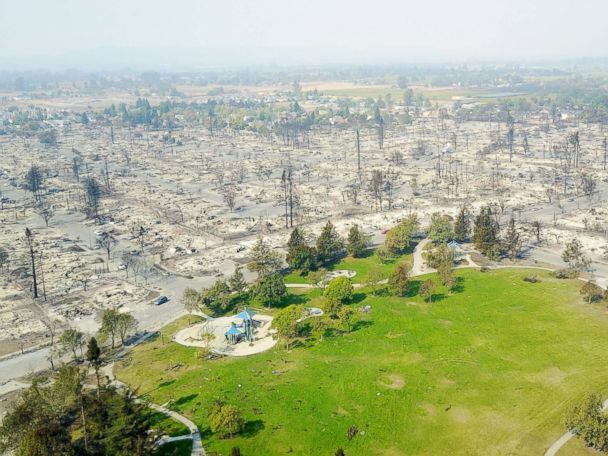 President Donald Trump visits the charred wreckage of Skyway Villa Mobile Home and RV Park with Governor-elect Gavin Newsom, left, Brock Long, right, Paradise Mayor Jody Jones (2nd R) and Governor Jerry Brown in Paradise, Calif., Nov 17, 2018. Members of the California Army National Guard take a break at they search burned homes for human remains in Paradise, Calif., Nov. 15, 2018. A view from above of a burned out neighborhood in Paradise, Calif., Nov. 15, 2018. The Camp Fire, which wiped out the town of Paradise, became the state's deadliest on record. Firefighters carry a body bag with human remains discovered at a mobile home park destroyed by the Camp Fire, Nov. 14, 2018 in Paradise, Calif.
Denise Chester, an evacuee of the Camp Fire, hugs her son Antonio as she volunteers at a makeshift shelter in Chico, Calif., on Nov. 14, 2018. Chester, who wasn't ready to learn whether her home survived, said "I want to help. I don't want to shut down." Search teams gather outside the Tall Pines Entertainment Center during a briefing before beginning cadaver search operations for the day in Paradise, Calif., Nov. 14, 2018. Yellow caution tape marks the spot where human remains were discovered at a mobile home park that was destroyed by the Camp Fire on Nov. 14, 2018 in Paradise, Calif. 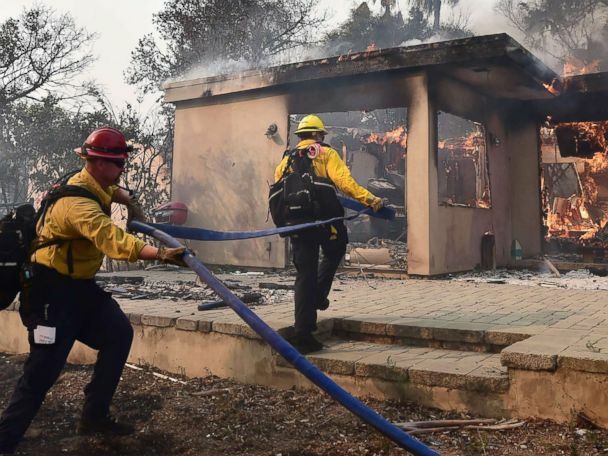 The Woolsey Fire burns in the Santa Monica Mountains National Recreation Area, Nov. 13, 2018, in Newbury, Calif.
Search and rescue workers search for human remains at a trailer park burned by the Camp Fire, Nov. 13, 2018, in Paradise, Calif.
A firefighter battles a fire along the Ronald Reagan Freeway, aka state Highway 118, in Simi Valley, Calif., Nov. 12, 2018. Rubble remains where mobile homes once stood at the Camp Fire, Nov. 12, 2018, in Paradise, Calif.
A home destroyed by the Woolsey Fire is seen in Thousand Oaks, California, Nov. 12, 2018. A huge cloud of smoke from wildfires hangs over Malibu, Calif., Nov. 9, 2018. Firefighter Jose Corona sprays water as flames consume from the Camp Fire consume a home in Magalia, Calif., Nov. 9, 2018. Capt. Adrian Murrieta with the Los Angeles County Fire Dept., looks for hot spots on a wildfire-ravaged home, Nov. 10, 2018, in Malibu, Calif.
Yolo County Sheriff's Office Animal officer Tim Share rescues an injured horse following the Camp Fire in Paradise, Calif., Nov. 10, 2018. Smoke darkens the sky as the Woolsey Fire burns in Malibu, Calif., Nov. 9, 2018. Firefighters Jason Toole, right, and Brent McGill with the Santa Barbara Fire Dept. walk among the ashes of a wildfire-ravaged home after turning off an open gas line, Nov. 10, 2018, in Malibu, Calif.
As the Camp Fire burns nearby, a scorched car rests by gas pumps near Pulga, Calif., Nov. 11, 2018. A deer walks past a destroyed home on Orrin Lane after the wildfire burned through Paradise, Calif., Nov. 10, 2018. A vehicle drives through smoke from a wildfire near Pulga, Calif., Nov. 11, 2018. Equine veterinarian Jesse Jellison carries an injured goose to transport during the Camp Fire in Paradise, Calif., Nov. 10, 2018. Roger Bloxberg and his wife Anne hug as they watch a wildfire on a hilltop near their home, Nov. 9, 2018, in West Hills, Calif. Firefighters push down a wall while battling a fire in an apartment complex in Paradise, Calif., Nov. 9, 2018. Paradise resident and Camp Fire evacuee Christine Fitzsimmons, 50, gets emotional while sitting with her dog at the Red Cross shelter in Chico, Calif., Nov. 9, 2018. A house burns during the Woolsey Fire on Nov. 9, 2018 in Malibu, Calif.
Krystin Harvey, left, comforts her daughter Araya Cipollini at the remains of their home burned in the Camp Fire, Nov. 10, 2018, in Paradise, Calif.
A wildfire burns in Camarillo, Calif., near Highway 101, Nov. 8, 2018. Medical personnel evacuate patients as the Feather River Hospital burns while the Camp Fire rages through Paradise, Calif., Nov. 8, 2018. Horses are tied to lifeguard booths on the beach in Malibu, Calif., Nov. 10, 2018. 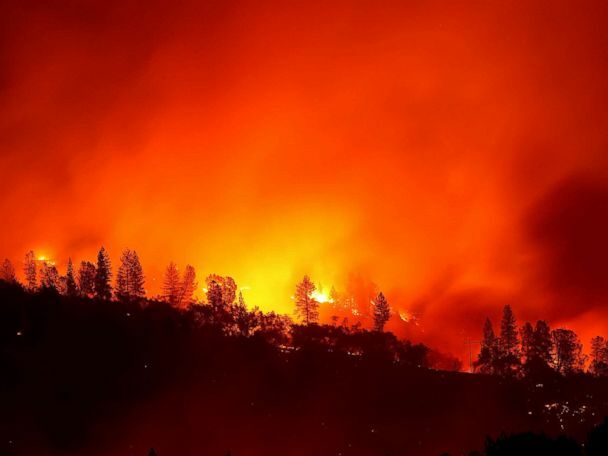 Wildfires are burning in both Southern and Northern California. Power lines rest on cars that were burned by the Camp Fire on Nov. 10, 2018 in Paradise, Calif. Firefighters work to keep flames from spreading through the Shadowbrook apartment complex as a wildfire burns through Paradise, Calif., Nov. 9, 2018. A store burns as the Camp Fire tears through Paradise, Calif., Nov. 8, 2018. The Camp Fire is now the most destructive and deadliest in California's history.